Jury selection in the trial of Boston Marathon bombing suspect Dzhokhar Tsarnaev will resume Thursday. Sixteen prospective jurors were questioned Wednesday after a two-day delay because of a snowstorm. Tsarnaev is charged in the 2013 attack that killed three people and injured more than 260. Jury selection in Tsarnaev's federal death penalty trial began Jan. 5. Jury selection was canceled Monday and Tuesday after a storm dumped up to 2 feet of snow on Massachusetts. A total of 173 potential jurors have now been questioned. Judge George O'Toole Jr. has not revealed how many of those have been dismissed. The judge and attorneys heard from at least a half dozen people who said they already believe Tsarnaev is guilty A prospective juror in the trial of Boston Marathon bombing suspect Dzhokhar Tsarnaev became tearful as she spoke of an 8-year-old boy who was killed in the attack. 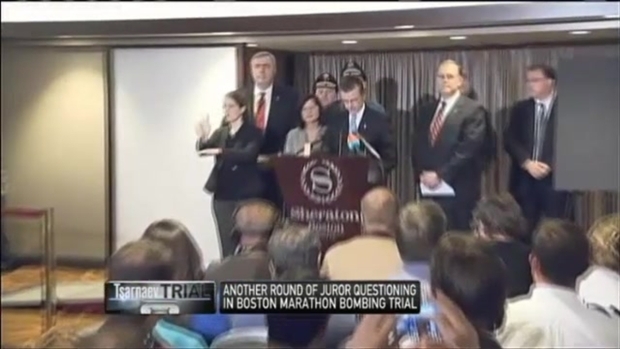 On the marathon bombings: "Sure, I know a lot of people who were affected by it. ... I think everyone in the country was affected by it in some way." On the death penalty: "I don't think it's ever a deterrent, but I think it has the potential to provide justice for the victims." On whether he would consider facts about a defendant's background when deciding whether he should get life in prison or the death penalty: "Maybe they just didn't have a fair shake. ... There's a little wiggle room in everything, I guess." On the death penalty versus life in prison: "Myself, personally, I wouldn't want to spend the rest of my life in jail." "I certainly think that he is probably guilty, but I cannot tell for sure." "Everything here is very disturbing for me, and I take it very personally." "My husband runs marathons, and he could be there. I could be waiting for him." On his attitude toward police officers: "A lot of them get carried away with their attitudes of self-importance." On the death penalty: "I don't feel I have a particular moral objection to it." "I favor it. I'm not sure I can do it." "I'm not sure it's up to me personally to decide who lives and dies." "I don't know. No matter how you ask that question, I don't know if I can do it."